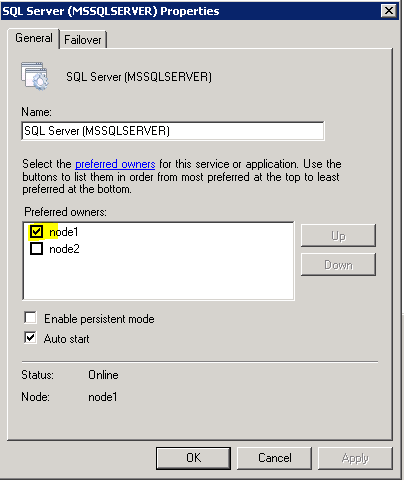 Ever had to restart several nodes of a cluster? What do you do with the clustered resources after all nodes are back up again? Right, you redistribute them. Tedious work if we’re talking about really big clusters with many clustered resources. Write-Host "Moving resource to $PreferredOwner, please wait..."
write-host "Resource is already on preferred owner! ($PreferredOwner)"
Write-Host "`n`nFinished. Current distribution: "
This entry was posted in Windows Server and tagged Failover Clustering, PowerShell by admin. Bookmark the permalink. Great script! As a powershell novice, this saved me a ton of work. I added -Cluster to make a remote call to another server. That helps for when we patch our servers and have multiple clusters to work on. Thanks again!